Interior dimensions 110 x 70 x 30 mm. 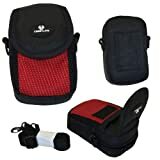 This Case4life camera case is an excellent way to carry your expensive digital camera and protect it at the same time, the case is shockproof and splash proof to help make sure your camera is always safe. This case comes complete with a lifetime warranty, a belt loop attached to the rear of the case and a removable neck strap. All cases include the Case4life logo. This excellent case is a must have for anyone with a digital camera that they want to protect. The small case is made of a shockproof material that protects your camera from bumps and drops. The case is also splash proof meaning your camera will always remain dry come rain or shine! The case comes with a fixed belt loop attachment which can be seen in the pictures, as well as a removable neck strap to make sure you can always keep your camera close. The interior dimensions of this case are: 110 x 70 x 30 mm. As always all Case4life products are also sold with a lifetime warranty to give you that extra piece of mind. This entry was posted in Discount Photography and tagged Camera, Case, Case4Life, Digital, G050, G051, Gapo, Lifetime, Nylon, PowerLead, Red+Black, Shockproof, Soft, Splashproof, Warranty by Ball Photo. Bookmark the permalink.